Samsung's new TL500 is capable of shooting RAW with a crazy fast F1.8 lens and lets you view it all on a twisting AMOLED screen. It's possibly Samsung's best point-and-shoot ever, and it could be a Canon S90 killer. In October, we swore that the Canon Powershot S90 would never leave our pockets. But we might be willing to empty them out for Samsung's TL500. The TL500 packs a 1/1.7" CCD sensor—the same size as the S90's—and has a 24mm Schneider f/1.8 lens which makes for faaaast shooting and wiiiiide angles, with 3x optical zoom. The TL500 smartly scales back on the megapixels for better low-light performance, packing 10 as opposed to the 14MP offered by their recently announced CL80. The TL500 shoots RAW and offers the garden variety of shooting modes including full manual control, and it has Samsung's Smart Auto 2.0 and Dual Image Stabiliziation tech for recognizing surroundings and keeping them sharp in your photos. Sweetening the deal, the TL500 has a swiveling 3.0" AMOLED screen, so you will be able to see your shot no matter what crazy position you find yourself in. But—and there's always a "but," isn't there—the camera only shoots 640x480 video, and with a steep pricetag of $449, we would've liked to see 720p capability. 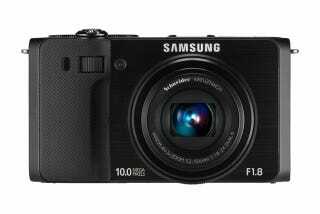 Nevertheless, Samsung has been steadily improving their camera offerings, and with the TL500 they might have created their masterpiece. You can be sure that we are going to get our hands on one as soon as possible to see if that's the case. It'll hit shelves sometime this spring. Anaheim, CA (February 20, 2010) - Samsung Electronics America, Inc., a market leader and award-winning innovator in consumer electronics, proudly introduces the 10 mega-pixel TL500, a high-end compact digital camera designed specifically for today's advanced and enthusiast photographers. The new flagship of the company's compact digital camera family, the new TL500 incorporates a full-range of advanced features, including a high-performance imaging sensor and one of the brightest lenses ever featured on a compact camera – a 24mm ultra wide angle Schneider KREUZNACH, f/1.8. The TL500 will be on display during PMA 2010, February 21 23, in the Samsung booth, #2227, in the Anaheim Convention Center. "With the TL500, Samsung further differentiates its lineup from the competition and achieves yet another milestone in the industry," said Mr. SJ Park, CEO of Samsung Digital Imaging Company. "With ultra-wide angle capability and unparalleled speed, the TL500's lens offers a new level of versatility allowing the user to be more creative and take better pictures." The Samsung TL500 is sure to turn heads thanks to its ultra-wide, f/1.8 Schneider lens – one of the brightest ever featured on a compact digital camera. The impressive f/1.8 lens offers photographers a wider range of aperture steps and shallow depth-of-field, giving them the ability to blur out the background of their images while maintaining focus on their subjects. The ultra-fast, f/1.8 lens also allows users to take better photos in low-light environments as more light is passed through to the new high-performance 1/1.7" CCD sensor. Larger than the sensors typically found in compact digital cameras, the TL500's 1/1.7" CCD offers unrivaled sensitivity (max ISO 3200/full-resolution). Together with Samsung's re engineered and fast, DRIMeIII imaging processor, the TL500 captures high-quality images, regardless of the lighting environment. The high-end Schneider lens offers a 24mm, ultra-wide focal length and 3x optical zoom. Much wider than traditional compact cameras, the TL500's 24mm ultra-wide angle lens allows photographers to capture more of a desired scene, such as beautiful landscapes and large groups of friends or family. For blur free images, the TL500's lens is also paired with Samsung's Dual Image Stabilization technology. Composing and reviewing images on the TL500's three-inch, swiveling AMOLED screen is a pleasure. The rotating AMOLED display will allow photographers to precisely frame their images the way they want and shoot from just about any angle, including overhead or low to the-ground shots. Compared to the traditional TFT-LCD found on most digital cameras, the TL500's AMOLED provides users with a higher contrast ratio, deeper blacks and more accurate, vivid colors, even when viewed from an angle or in direct sunlight. The TL500's AMOLED display is also more efficient when it comes to power consumption, allowing photographers to maximize battery life and shoot longer on a single charge. The TL500 supports RAW and gives enthusiasts full control over their images thanks to its shutter priority, aperture priority and full Manual shooting modes. When using these settings, shooters can experiment with features such as slower shutter speeds and depth of field; however, for those who prefer ease-of-use over manual controls, the TL500 also offers Samsung's Smart Auto 2.0 (Still & Movie) scene recognition technology. Applicable for video recording (640x480 / 30fps / H.264) and taking digital stills, this intelligent feature analyzes the scene and then automatically selects the appropriate settings for the best results possible. Using this mode requires minimal effort and does not sacrifice image quality for simple operation. Samsung Electronics America's PMA 2010 press releases, video content and product images are available at www.samsung.com/newsroom.